boy in blue, originally uploaded by pseudobunny. got new converse to replace the awesome handmedowns. he lost one of his shoes when he got his foot stuck in the pipe on the sidewalk. bummer he cried about it to anyone who would listen so today we got new ones. only $20 but i do feel bad when I know he will out grow them soon. we will pass them on though so that is good. 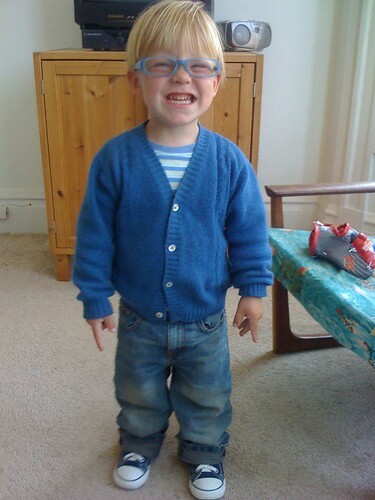 he then wanted to wear my new glasses so i had to shoot this photo of him in so much blue. he chose the color for the new sneaks. he was very excited and dancing it up at shoebiz. pretty cute.